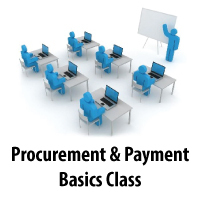 The Procurement & Payment Basics class will help university employees understand and use appropriate forms and processes to purchase and pay for the goods and services used to conduct university business. Topics include procurement and payment policy, procedures and methods including requisitions, bidding, purchase orders, purchasing cards, payment requests, campus orders, limited purchase orders and other options. Sessions are held in the Purchasing Department located in the Park Building 201 S Presidents Circle, Room 170.